As an association, CAUBO promotes professional and effective delivery of services and administration of resources in all facets of higher education. These awards recognize and share the achievements of our members’ projects through the introduction of new services, improvement in the quality of services provided, and/or the management of human, financial, IT and physical resources, or risk. Have you recently implemented a new and innovative initiative that has improved operational efficiencies, or the overall sustainability of your institution? Or perhaps an initiative that stems from your strong institutional entrepreneurial spirit? That’s the kind of project we want to hear about. The process isn’t as intimidating as you might think. The application form gathers general project information and provides an area to assess how your project meets the evaluation criteria. Although not required, you may include a more complete description of the project and provide supporting material such as manuals, other documents, and website references to be considered. All supporting material must be submitted with the application. Applicants should note that application and supporting documentation will be published on the CAUBO website in the Quality and Productivity Database, unless they are clearly marked as confidential. Up to five national prizes are awarded annually, each with a token cash award and plaque. Additionally, there are opportunities for Honourable Mentions (plaque only). Prizes will be awarded by the Selection Committee based on merit. The Committee reserves the right to determine the number of awards granted. Awards winners will be presented with prizes and plaques by the sponsors at the Annual CAUBO Conference in June. Cash award will be determined annually based on the number of awards granted and the amount of sponsorship received. Individual awards will range between $1,000 and $2,000. 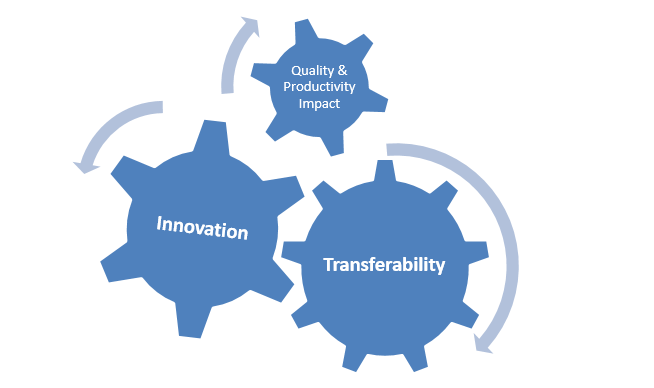 30 % Quality and Productivity Impact – the extent to which the project has contributed to an improvement in quality (e.g. improved services and/working conditions as perceived by staff, client/end user, community or others) and/or in improvements in effectiveness and efficiency, as measured against baseline data (e.g. : dollars saved relative to previous costs; number of transactions eliminated relative to baseline numbers, additional revenues relative to base revenues, extent to which a risk was mitigated, etc.). The concept of your project must be replicable at other institutions. Clear documentation of how the project has been implemented and, where applicable, well-articulated evidence of the outcomes reflecting at least 12 months of measurable results are also required. One of the main objectives of the program is to encourage the transfer of knowledge and the dissemination of information. The applications are published annually by CAUBO on its web site for consultation by members. In addition, abstracts of the winning projects, together with the title and contact persons for all submissions, are published annually by CAUBO in a booklet, which is distributed to members and inserted into the summer issue of University Manager magazine.